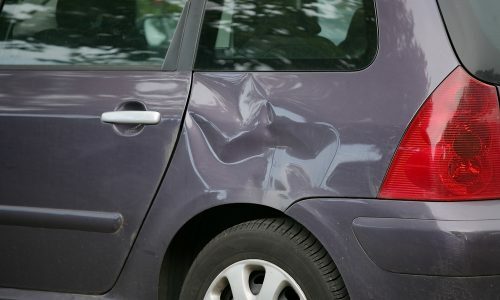 Algis Collision: Auto body repair and collision services. So, you’ve been in a car accident. Don’t stress! We understand that being in a collision is a traumatic experience, that’s why we strive to make your repair process as hassle-free as possible. Our skilled technicians have years of experience repairing all types of vehicle damage and can handle any repair that comes our way. We make it a priority to get you back on the road safely. Our experts use the latest auto body collision repair technology to fully restore your car back to pre-accident condition. We can repair aftermarket parts or use original manufacturer parts to bring your car back to life. Cost efficiency is important, so our professionals will use their extreme attention to detail to assess the damage on your vehicle and choose the best solution that fits your budget. Some auto body shops take short cuts when re-painting vehicles, using minimal effort to perfect the job. That’s not the case when it comes to Algis! We know that nothing is more inconvenient than mismatched paint on your newly repaired car. It brings attention to the repaired spot, which causes more stress in the long run. In our hands, we promise you’ll receive a seamless paint application. 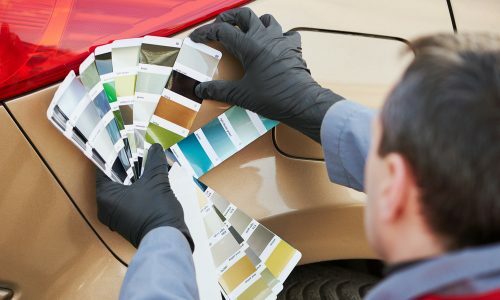 Our highly qualified technicians have been trained to use cutting-edge technology to match your paint exactly. We use paint codes directly from the manufacturer for a guaranteed match. Once the paint match has been identified, we will begin the painting process in our state of the art booth. This booth providides optimal lighting and temperature for a smooth, successful application. 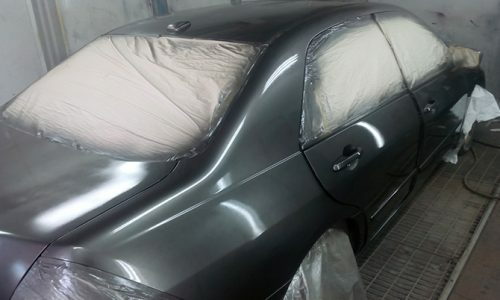 Have you ever seen a car that received a sprayed paint job, but lost its shine within a few weeks? It’s a common thing among the cheaper body shops that have not invested in a low bake oven. 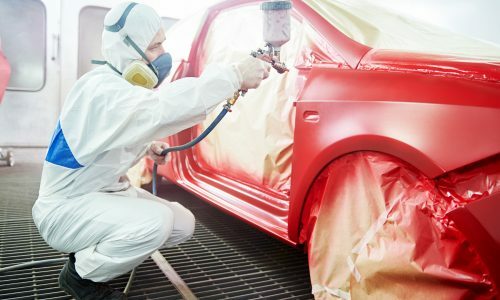 At Algis, we use superior technology to give you the paint job your vehicle deserves. We have a Timbo spray booth that moves air from the top ceiling and out from below, providing the most efficient dustless paint technique. Paint is then baked on your car frame at 150 degrees for a half hour to provide a smooth finish. Our oven baked painting technicians will make sure that you receive a high quality paint job to last you for years to come. We guarantee to keep your car looking as fresh as when you first purchased it! If you’ve recently been in an accident, there’s a high chance that the frame or unibody of your vehicle is damaged. If you feel that your car isn’t driving straight or is pulling to one side, our unibody and frame straightening technicians are here to help. Bending metal back into its original state is no easy task, but our team has extensive experience in repairing all types of bent and folded metal. With high quality equipment, we can use precise accuracy to determine the amount of alignment needed. Years of experience in unibody and frame straightening has allowed us to become a trusted, reliable source of repair. The team at Algis is ready to restore your vehicle’s frame back to its original condition. Are you tired of looking at those little scratches and dents on your car, but are unable to replace the whole area? Algis paintless dent repair (PDR) is a perfect option for you. We can restore the area back to its original state without the use of sanding, body fillers or painting. There’s no need to worry about the cost and hassle of a completely new paint job. As long as the paint is still intact, our experts will be able to perform PDR on dents of all shapes and sizes. Throughout the years, Algis has repaired various types of damage, whether the cause was hail, abuse, vandalism or accidental. It is our mission to provide you with quick and cost-effective service. 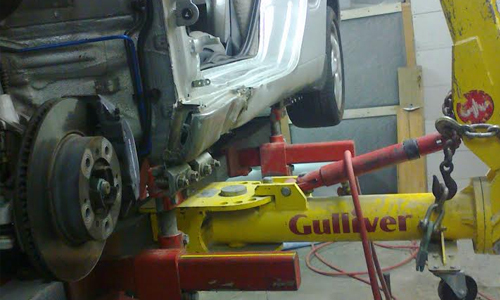 Our experts can perform PDR on your car and have it finished rapidly. Save time and money by working with our paintless dent repair experts!